I think my lack of posts is evidence of just how busy this year has been! I've been having a wonderful year with my elementary students and I have added some private clients on the side. Now that we've had a snow day and a delayed start, I'm back to making materials! Woohoo! Please enjoy the handout I've prepared for articulation of /r/. This handout is included in a "later sounds" bundle available on my TpT store for $4.00. I made the decision to charge for many of my materials due to the considerable amount of time spent designing custom art and creating them. However, please send me an email (speechlanguagecity@gmail.com) if cost is prohibitive - if you are unable to pay and I will work something out. You can download it here. 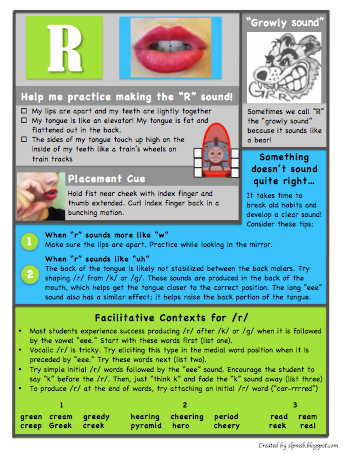 I've also created handouts for L, TH, S/Z, SH, CH, and K/G. J is next on the list... Stay tuned! As always, drop a line if you've downloaded this resource and have found it to be useful, or have any suggestions for improvements. Thank you so much for posting this!!! I absolutely love your blog. I found it over winter break when searching for a way to improve the lateral lisp. I am also a school based SLP. I'm doing my CFY currently. Over Christmas, I printed out almost each of your posts to put into a binder. I especially love your book of the week handouts and your articulation handouts!! These handouts are AWESOME!! Thanks for creating and sharing! Thank you for sharing! Great handouts!